ELECTRIC QUILT 8 is here! 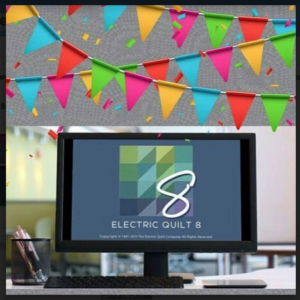 Electric Quilt has released a new version of its quilt design program –EQ8. This is your chance to see how it works! We are bringing in Barb Gardner, who was a beta tester for the program and has been working with it for some time. Barb will show and demonstrate EQ8. She has tons of information to share! This new version has promised a new level of user-friendliness and early reports are that it really delivers! Come see for yourself. There are Mac and PC versions. For those who own EQ7, come for a demo to see the new features EQ8 has to offer. Your program can easily be updated to EQ8. For those who don’t own EQ, come to see a demo of how it can change your quilt designing life by taking your quilting into the computer age. Let EQ8 make your computer a virtual design wall. It’s so much faster and easier than graph paper and colored pencils or making sample blocks and using a design wall. click of a mouse. No more math to get the design you want..
NO computer needed for this demo. Just bring a supplies to take notes, if desired. Wooden Spools has programs and upgrades in stock. then join us for this live demo. Please RSVP – we’ll have some refreshments on hand and really look forward to Barb sharing her expertise with you!